Frankenstein is my very favorite story and I just started listening to it once again on audiobook and all i can say is... it's still my very favorite story. Nice work 18 year old Mary Shelley. It's one of those books where you're so familiar with the story from all of the movie versions that you think you know inside and out what it's all about, then you read it and see it couldn't be more completely different. For anyone who hasn't read it yet I won't ruin it by telling you what it's really like, but i will say he doesn't walk around slowly, grunting like a zombie. 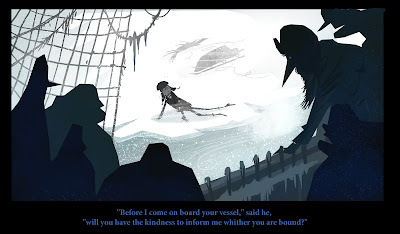 Here's a shot from the very beginning where Dr. Frankenstein is pursuing his demon creation literally to the ends of the earth, up on the North Pole, where he is on death's door and happens upon a ship very coincidentally exploring the north pole. 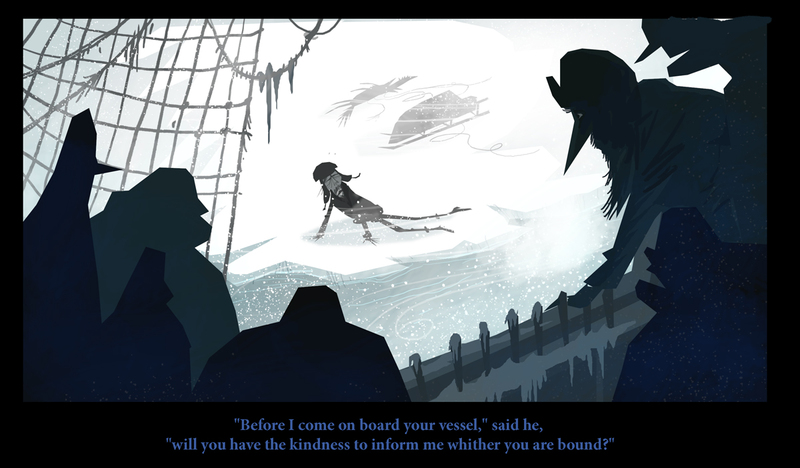 He's down to his last sled dog and almost frozen to death and the ship's captain asks him if he wants a ride but instead of saying "sure that would be great, i'm almost dead" he says "mmm, i dunno. it depends which way you're going. 'cause i made this demon creation and i'm really into catching and destroying him" but he says it in that old-timey eloquent way people used to talk back then that's super cool. and that's just the beginning. I love this book. And here's a little animated diddy i whipped up for the occasion. LOOK OUT!! A CREEPY SPOOKY SKELETON CAT IS COMING IN JULY!!! How many times have you been reading some lame picture book to your kid about green eggs and ham or a boy playing on an island with a bunch of monsters and thought "this is Ok, but what I'd really like to be reading is a story about a dead cat who is struck by lightning and comes back to life to pursue his unfulfilled ambition of being a famous drummer in a rock band. And oh yeah... I'd like it to rhyme"
Well... 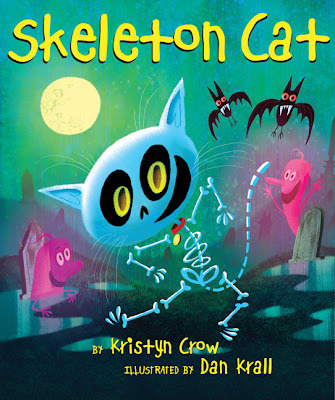 I can't tell you how many times I've thought that same thought, which is why when the opportunity to illustrate Kristyn Crow's delightful "Skeleton Cat" manuscript (published by Scholastic) came up I jumped at it! So for those of you who have been walking around all this time with a sad, empty, hollow, miserable, dead kind of feeling inside because of your inability to read a story such as this, I have this to say to you. It's time for you to turn your life around and be happy again by clicking the link here and buying this book. And for those of you who have been wishing for the same kind of story except one that features a zombie hedgehog instead of a cat, you might as well go ahead and buy this one because that's kind of ridiculous and no one is ever going to put out a book like that and this is probably as close as you're going to get, plus there are a few hedgehogs in it too so it's almost the same thing. I am now pleased to present to you, coming soon to book stores and book clubs, wittily written by Kristyn Crow, lovingly painted in Photoshop by yours truly and published in lush, flexi-plyable paperback by Scholastic. SKELETON CAT!!! available July 1st 2012. I've been really enjoying this audiobook called "Skullduggery Pleasant", it's a kid's novel about a skeleton detective and a preteen girl who solve supernatural mysteries. 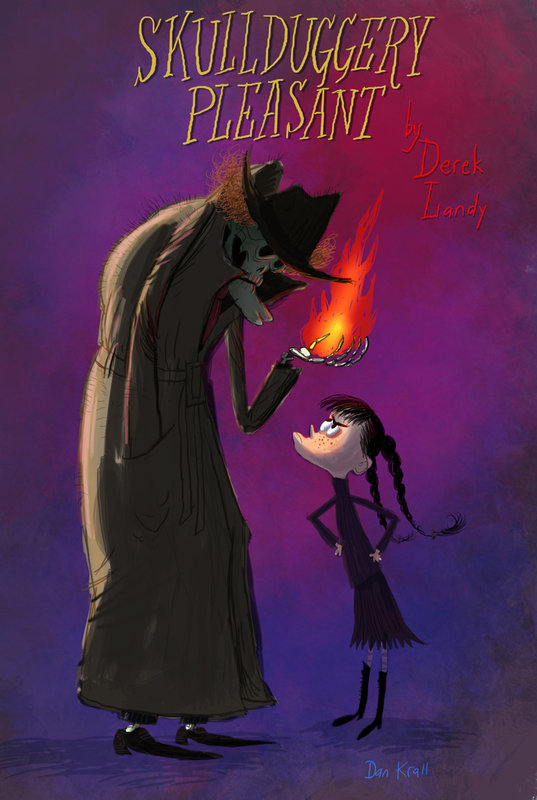 It has kind of a zoot suit vibe to it which is a bit of a bummer for me, but if you aren't bothered by that kind of thing or can look past it, the dialogue and interaction between the girl and the skeleton has a very funny, dry wit to it and they go on a reasonably good adventure. It's also an Irish book and the audiobook is read in all Irish accents which is kind of fun.